I’m excited to announce that the Gynnes Cardigan is ready for test knitting! If you are interested, please go to my Ravelry group Heddi Craft Designs and sign up. Deadline for finished garments is January 31, 2017. I’ve been thinking about starting a new series here of some designs that have caught my eye as a browse Ravelry or pick up new (and old) magazines. These are designs that I might never knit, so I’m not sure I can say I’m “stalking” them as many knitters describe this window shopping experience, but they have elements that I find interesting or attractive. 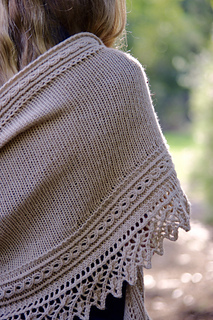 For my first installment, I want to share some of the shawl patterns by other designers that caught my eye in the Indie Design Gift-a-Long. These are patterns by new to me designers. 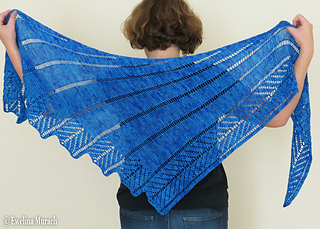 Dreamcatcher is a bias knit shawl by Ewelina Murach which caught my eye because of the diagonal lines of yarn overs, almost rays, coming from one corner of the shawl. I love how there is some lace texture at the end of each ray that really comes into focus when the shawl is wrapped around the model’s neck! Finally, Maribou, a cabled shawl by Kino Knits, was my third pick. 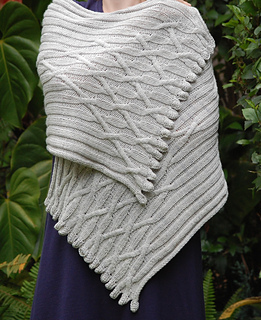 This shawl has a lovely pattern of cable crossings that each end with a shaped point so that they look like feathers. 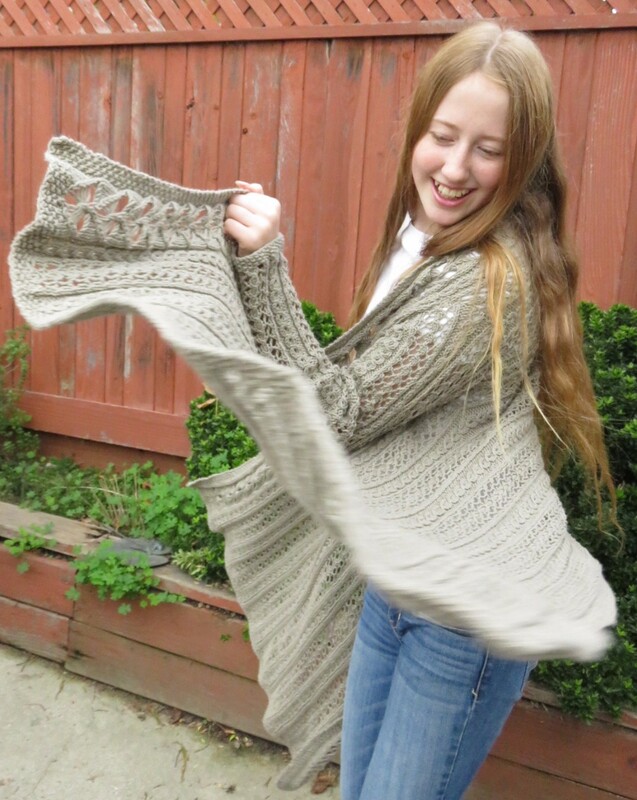 The center spine on this rectangular shawl also evokes the sense of wings. I really enjoyed reading the backstory of the inspiration for the shawl. All these patterns are part of the GAL and are 25% off through Nov. 30, 2016 with the giftalong2016 coupon code! For the past several years, a group of amazing indie designers have been hosting a sale/GAL/CAL to support independent designers on Ravelry. Over three hundred designers are participating this year and there are literally thousands of patterns to choose from, including six of mine! All participating patterns are 25% off through Nov. 30th and then the knit/crochet-a-long runs through the end of the year. There are several ways you can view all the patterns. One thread in the group includes sample pictures like this one of mine for each of the designers that give you a taste of what the designer has in her shop. You can click on a link to get to the designer’s shop and see all the sale patterns in a bundle. If you have Pinterest, you can look at all the available patterns through the boards that have been set up there by category (those categories are also the categories for the KAL/CAL). There are literally hundreds of prizes for the GAL portion and even a special prize for someone who completes one project from each category. So, go check it out for some great deals and support indie designers this holiday season! 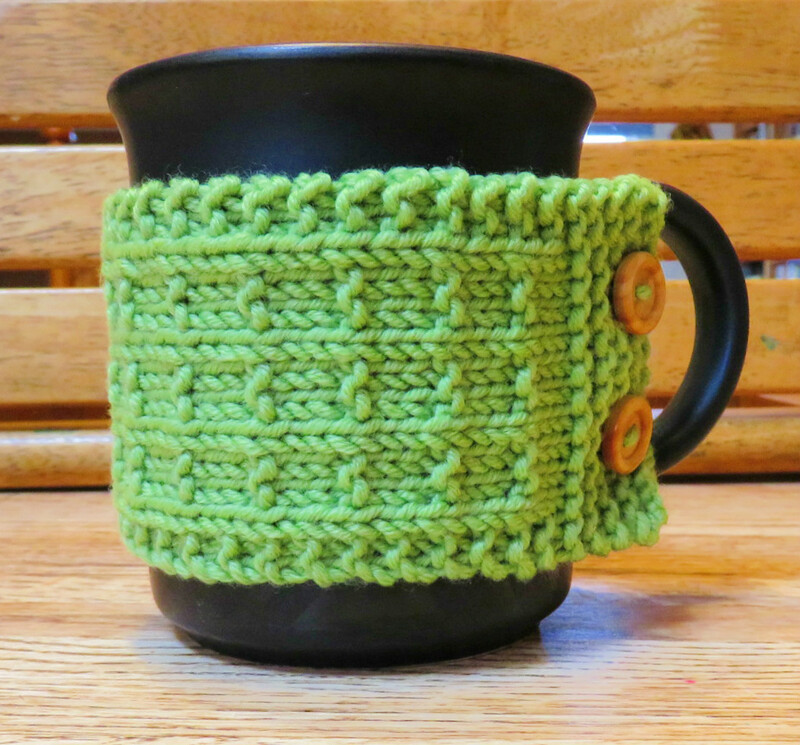 Yesterday I released a new pattern for a Coffee Cup Cozy on Ravelry. This is a pattern I designed to teach a class on beginning knitting at our new yarn shop in town– Yarn Shop Santa Cruz. It uses almost only knits and purls and is a small project that can be finished by a beginner in a short amount of time. The class came with eight additional pages of handouts, but the pattern itself is a great one for using up scrap yarn and for charity knitting for more experienced knitters. Charity knitting in on my mind because a local non-profit, the Homeless Garden Project, collects knitted and crocheted items each year for their holiday gift store. For the past couple of years, I’ve been getting together with a group of moms for a couple of evenings to knit and crochet quick little items like this cozy for their store. Many of us are one income families and so pulling out our yarn and making a few things feels like a way we can give back to the community. The Coffee Cup Cozy is free through October 15th, so download your copy today for your charity knitting! To introduce my newest design to you, I first have to tell you about Roxanne Cummings, my midwife. When my husband and I got married, we knew we wanted to have children and we also knew we wanted to have home births. When we became pregnant with our first child in 2000, we met Kate Bowland and Roxanne Cummings, a pair of midwives who worked together as the Midwives of Santa Cruz. Monthly appointments alternated between Kate and Roxanne and then whoever was on call would attend the birth. For subsequent births, the midwife at the first birth tried to attend unless she was with another mother. Roxanne was the midwife who attended our first birth and then our second and third births as well. A home birth is a fairly intimate gathering– the mother, her partner, the midwife, her assistant, and maybe the younger siblings. Roxanne was the perfect midwife for us. Her energy and fire were a great complement to my husband’s solid and quite nature. As the years went by and we went beyond our childbearing years, Roxanne always had time to talk to us if we saw her around town, she always had a memory to share with us about our birth experiences. My pregnancies and births are a collection of moments– Roxanne curled up on cushions on the floor like a cat, murmuring encouragement for my contractions; Roxanne telling me that people are not usually planning their next birth during their current birth; Roxanne describing how your organs have to be “pretty creative” when making room for a growing baby in the uterus, Roxanne helping my older children find the baby’s heartbeat. And so many more. When Roxanne passed away in April, I was shocked and saddened. She had quietly been fighting cancer, but had not shared her journey widely– she was such a public person that it made sense, because as someone said at her memorial “you couldn’t take her anywhere” without meeting someone she knew. I sat with my grief for many days before I realized I wanted to make something to remember her by, something that would embody my memories and give me something to DO besides be with my sadness. I had a skein of Anzula Meridian yarn in a lovely sky blue colorway called Alice that I had been saving for a special project. I selected and modified designs to represent the life and growth and light and love that Roxanne brought to the mothers of Santa Cruz County, California. Vining flowers and heart shaped leaf motifs combine with a deeply scalloped knitted on border to create a classic lace shawl which expresses both love and hope. This shawl can be modified in width or length. Suggestions for how to modify the pattern are given, but details are left up to the knitter. 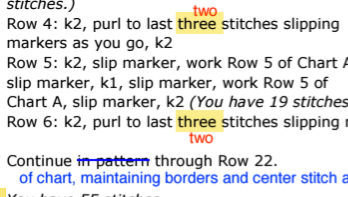 Remember that changes in the overall length or width will change the amount of yarn used and the overall stitch count. 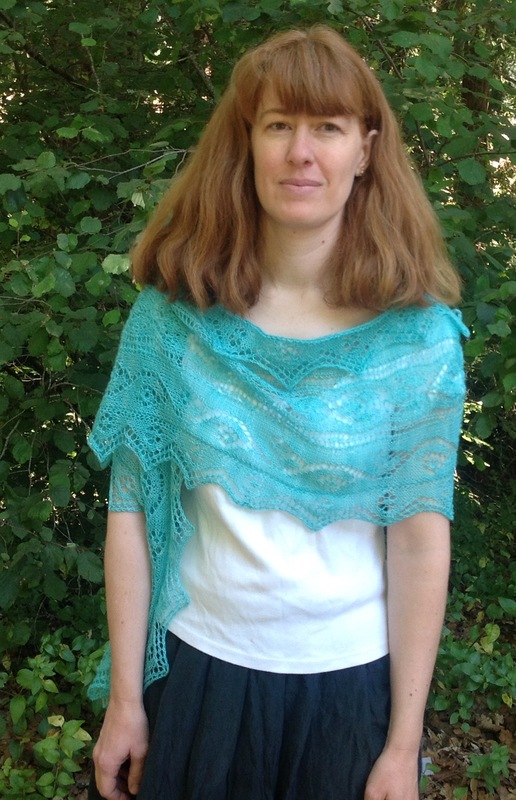 The Roxanne shawl is available on Ravelry and Craftsy. My knitting resides is a variety of bags, from re-purposed totes, to specialty knitting bags, to baskets, to bags I made myself. In fact, it seems I can’t choose just one. Here are some advantages and disadvantages to each. Baskets are great for use around my house. I don’t have curious pets or small children, so open topped baskets are pretty safe at my house. I’ve been using a small one for the 12 Days of Christmas Mitten Garland KAL so that I can easily manipulate my color work. 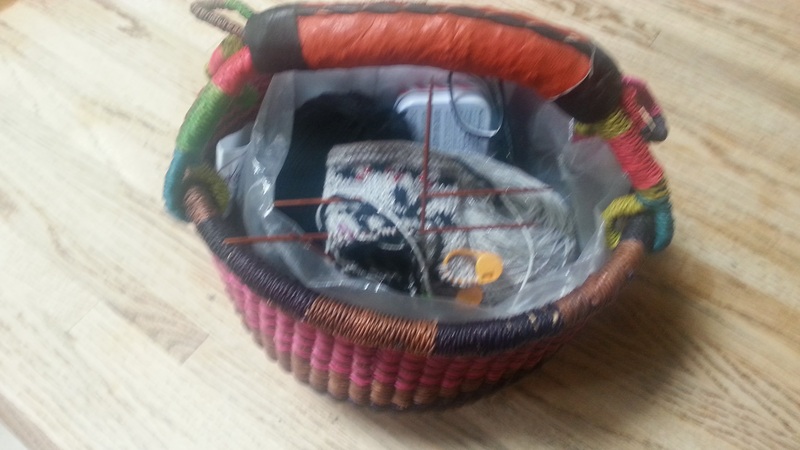 A larger basket that I lined with fabric to keep my yarn from snagging holds a shawl cardi I’ve been designing– it has a lot of yarn and the basket keeps it all in check. Totes are less likely to snag yarn than baskets, and I seem to prefer these for my lace projects. I have both open top and zippered totes, right now I’m using one that I’ve had forever from a local family magazine for a sweater project and another from a retreat for my new cowl design. One nice thing about a tote is that there’s always room for a few more items, so I seem to carry these a lot when going to my knitting group. 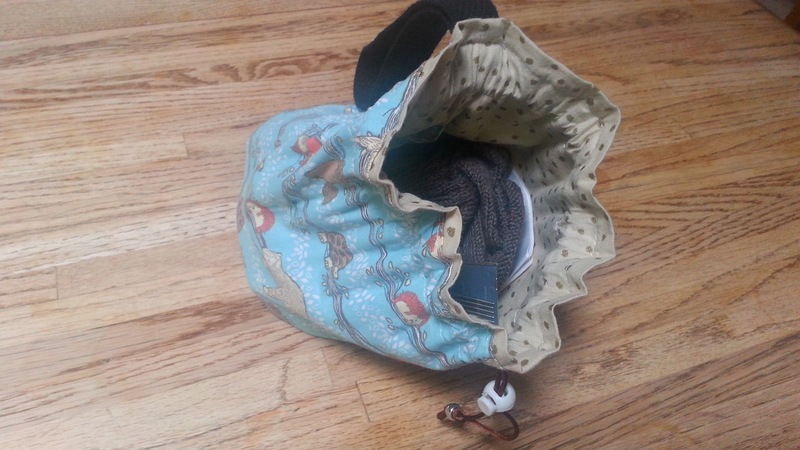 I love this bag from Slipped Stitch Studios which carries a sock project. 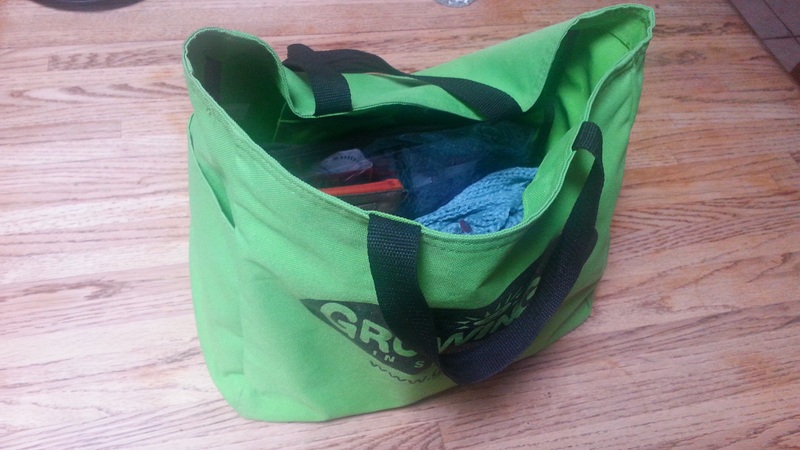 The great thing about drawstring totes is that I can toss them into another bag easily. I have another, simpler drawstring bag with another cowl in the works. 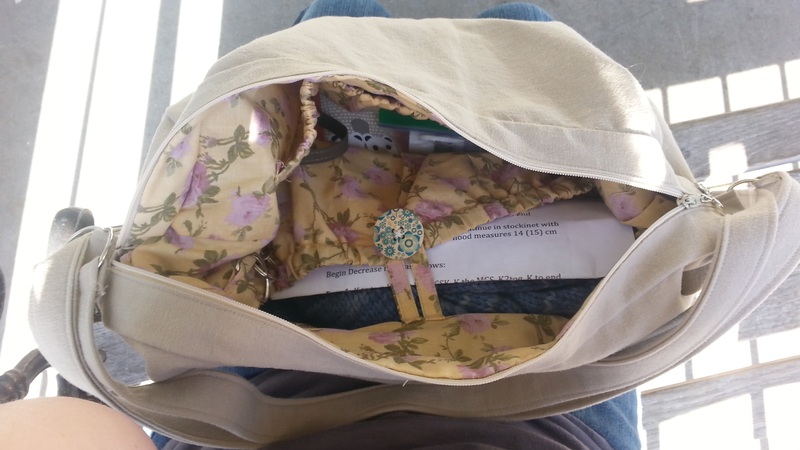 I’ve been using various store bought bags to carry my knitting along with my usual purse contents. I usually keep a project going that I take with me everywhere and work on it a bit at a time. Last week, I made a new purse with a special spot for my knitting and space for all my other things. The best part about this bag is the shoulder straps. They can be arranged to carry it over my shoulder, as a backpack or as a cross body bag. I was inspired by this pattern but made my own design for the bag itself.